Fantastic beaches and family friendly resort in the south west. 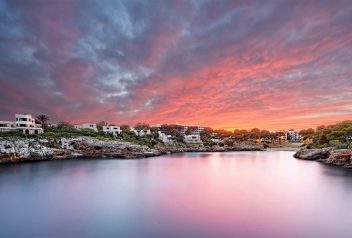 Calas de Mallorca is a resort town South East coast and about 70 km from the Capital Palma. It is a resort that is very popular for visitors that come from Europe and the UK. 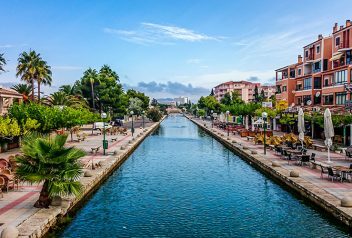 It boasts some of the best beaches and the town itself is very child-friendly with two playing areas right in the commercial centre. The town’s entertainment areas are built around the commercial centre and you will find all the shops, bars and restaurants in this area. 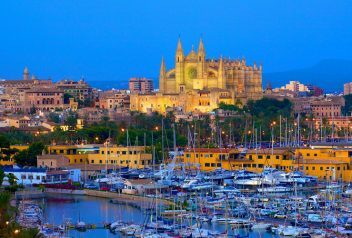 In and around Calas de Mallorca there are various sporting activities such as scuba diving, snorkelling and jet skiing. For those that would like a more sedate holiday, there are glass bottom boats that leave from the beach at Cala Domingos Gran. The main beach is named Playa Domingos Gran and is situated near the Hotel Globales America. The sea here is shallow but you do need to take note of the red flags and if they are up then you should not swim. The lifeguards generally have strict rules. The other beaches are Playa Domingos Petit and the smaller Cala Antena beach. There are plenty of water sports available and they range from jet skiing to scuba diving. But they also offer boardsailing, fishing and water skiing. Once you are in the beach area look around for the signs and you can partake in any of these water sports that are on offer. There are bicycles that you can hire from the suppliers in the commercial centre and if you would like to venture further you can also hire scooters and cars. They have two mini golf courses and one is actually in the centre of the shopping centre. 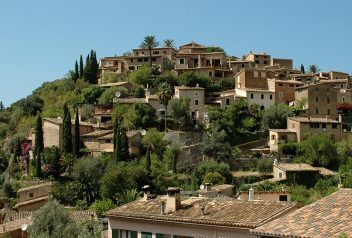 There is also the well known Val-d’Or golf course but it is a 10-minute drive from Cala de Mallorca. For the sports fans that would love to catch up with their favourite team while on holiday most the bars show live sporting events and football does tend to dominate the screens. Most the restaurants are in the commercial centre and you have a good choice of different cuisines. There are Indian restaurants along with Turkish, Spanish, Italian and Chinese. Some of the restaurants like the Los Amigos will have Barbeque nights on certain nights. Complimenting the restaurants there are quite a number of bars to choose from. They all have their different forms of entertainment and like the 3 Lions Fun Pub you can watch live sports, participate in Karaoke which is after 12 at night. There are some that offer live music some nights and the City Cafe also features Flamenco. The hotel that enjoys the best location is the Hotel Globales America which is situated on a small headland and overlooks the Cala Domingos Beach. 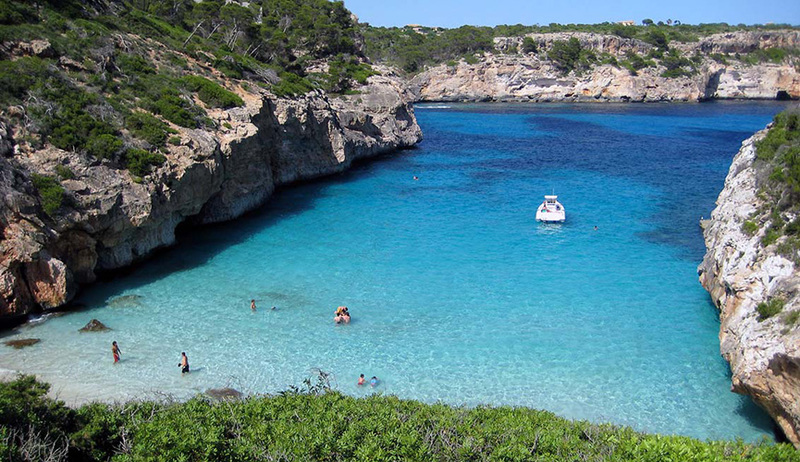 Cala Domingos and Cala S’Almonia are two nature parks that are worth going when you are in Cala de Mallorca. The Cala S’Almonia has a lovely beach and crystal clear water and because it away forms the coastal resorts it is very peaceful. 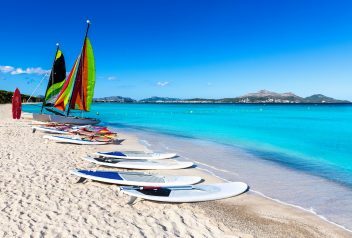 Cala de Mallorca is a quiet town with lovely beaches and ample water sports to keep you and your family entertained for the whole holiday. 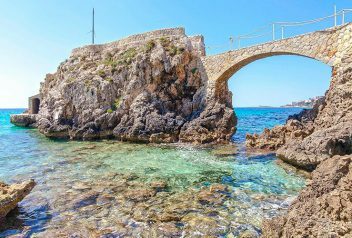 It is also a good base to have while you visit some of the attractions in nearby towns down the South East Coast of Mallorca.